The Blast-A-Way game for iPhone, iPod Touch, and iPad will blow you away with its diverse gesture controls, fantastic graphics, fun gameplay, and cool soundtrack. The universal download is a more expensive option at $4.99, but the trade-off is pretty sweet. You will not bombarded with the requests for in-app purchases and bonuses. The Blast-A-Way iOS game has a refreshing, well-organized home screen. You can scroll through the different worlds in which you will compete, check out all of the characters, and examine a tutorial. The different worlds take up the vast majority of the screen with the characters and tutorial simply accessed by one touch on a bottom menu bar. The different worlds can be examined through horizontal finger swipes. This opportunity to dig into the Blast A Way gamescape without a cluttered screen is an excellent choice. The five worlds are constructed of blocks made from different materials. You can get in touch with your inner hippie mother in the Fabric Fanatic world, or you can pay homage to your local bowling alley with Plastic Paranoia. Another neat touch is the cheeky descriptions of the characters. You find out their favorite colors, drinks, and skills. The tutorial pop-up is reminiscent of the home screen. You swipe your finger to uncover tips and clues to be successful in the game. The finishing touch to the tutorial is the great one-touch sort option at the top of the pop-up to learn more about navigation, bombs, and tips. 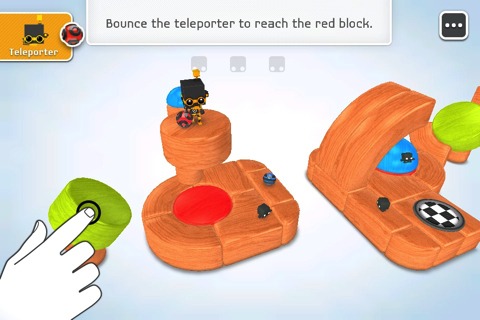 When you start playing Blast-A-Way, you start with the Wood Wonders gamescape and gradually unlock the next level. You will see quick results and progress, as you gather blocks and break towers with bombs. You will be impressed by the multiple accurate gestures that continue to make the gameplay interesting. You tap and drag your character to make it move. You can rotate the perspective and game scape with touches and drags. When you toss bombs, you touch the blocks to destroy and watch a trajectory. When you release your finger, the bomb takes off at that angle. In a nod to Uno, the bombs only destroy blocks and towers of similar colors. As you progress cool options like portals and and color hoops fill the screen and add exciting gameplay options. The Blast-A-Way iPhone, iPod Touch, and iPad game doesn’t fall into the category of repetitive gameplay and gesture controls. You must use two fingers, drags, taps, and swipes to win. And, when you win, you can post to your Game Center account. 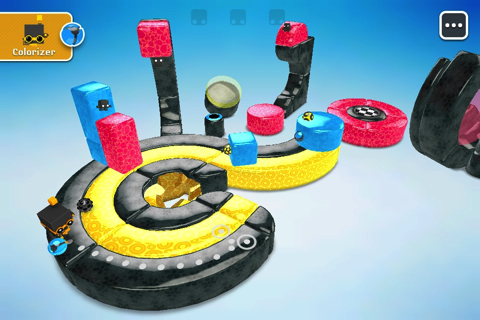 Blast-A-Way is a fresh perspective to iOS games. AppSafari review of Blast-A-Way was written by Jenni Ward on September 11th, 2012 and categorized under Adventure, App Store, Games, iPad apps, Puzzler, Universal. Page viewed 3800 times, 1 so far today. Need help on using these apps? Please read the Help Page.